Yogyakarta – Monday, January 28, 2019. Dr. Fernando Jeffry Sitohang M.B.A., has successfully passed a final defense to reach his doctorate degree. Dr. Fernando Jeffry Sitohang has successfully achieved the 262nd doctorate at Faculty of Economics and Business, Universitas Gadjah Mada and the 4320th at Universitas Gadjah Mada after completing his dissertation defense which has title “Signal Effect of Company Capital Structure and Simultaneous Relationship with Competition Between Companies in Imperfect Competition (Oligopoly) with very satisfying predicate.Opened by Eko Suwardi., Ph.D as dean of Faculty of Economics and Business UGM, his dissertation promoted by Prof. Eduardus Tandelilin, Mamduh M. 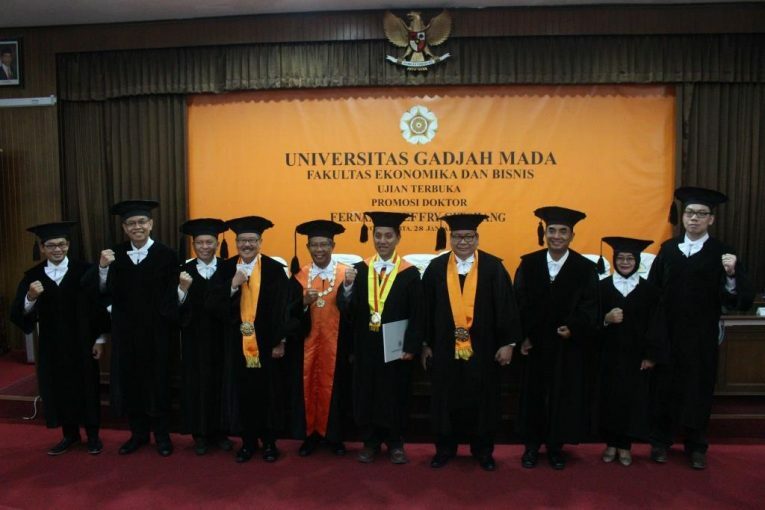 Hanafi., Ph.D, and Suad Husnan., Ph.D, and the examiner team were Prof. Marwan Asri, I Wayan Nuka Lantara., Ph.D, Bowo Setiyono., Ph.D, Eddy Junarsin., Ph.D, and Prof. Tri Gunarsih.The dissertation explains the company’s capital structure which is based on the development of knowledge related to capital structure. This study highlights the effects of the market on capital structure, and tries to explain the signal from the capital structure to competition that occurs within the industry. From information asymmetry, it is obtained that the intention of the company will be used and will affect the behavior of the industry, which in turn will affect the interaction of the company in the industry. The theory used highlights industry-specific oligopoly, because there are strategic interactions among players in the industry.Congratulation Dr. Fernando Jeffry Sitohang M..B.A, hopefully the title and knowledge can be useful for the world of education and the institution where he serve.